........ and 90% of everything we make. The standard "Wycombe Rhino Coated" mug has a capacity of 330ml, height of 92mm, diameter 80mm and circumference 259mm, weight around 295g. It is sometimes called an 11oz mug because it holds 11oz of liquid rather than weighs 11oz - with 259 grams being roughly ten and a half ounces. The "Duraglaze Coated Dishwasher Proof" mug is also a Durham shape, has a capacity of 335ml, height of 95mm, diameter of approx 80mm but a fractionally larger circumference 260mm. Duraglaze mugs come with a 50p suppliment on the unit price. Based on the Classic "Durham" shape, they are all earthenware products popular with Clubs, businessess and as promotions. In fact a "Durham" is the basic "go to" product of the mug industry. We also have a really nice Porcelain China mug (which we call a "Sandhurst") also adding £1-00 to our standard price. The Sandhurst is a Porcelain China mug which is also Rhino Coated. It has a capacity of 280ml, a weight of approx 266 grams. It's height is about 102mm and a diameter of 70mm / circumference 220mm of which we can print on around 165mm x 90mm height. It is very much a general purpose mug and is certainly robust - but adds that touch of class that comes with a china product. Many say it is really nice to drink tea from. This mug is not really suitable for printing with a "full sleeve" ... in other words with a solid colour from top to bottom. We do undertake it occasionally when asked, but the print near the lip and at the bottom can mottle a little - although customers have always appeared happy, we never feel it is the perfect finish. This shows the contrast in size between the standard mug (left) and the Sandhurst Porcelain Mug which is 10mm taller, but with a smaller circumference by 4cm. Confusingly our supplier calls this mug a "Windsor Rhino Coated", so that's what you will often see printed on the side of the box when it is delivered! However, we've always known this shape as a Sandhurst, so will continue to market it as such. As we headline in the lead to this page, Spring 2017 saw us introduce the Duraglaze Mug. Looking exactly the same as the standard mug it stands 2-3mm taller. It costs just 50p more per mug, but it has the added advantage of being a guaranteed dishwasher proof product. But we have tested our standard Wycombe Rhino Coated Mug regularly and have domestically dishwashed samples for years without any adverse effects - but Duraglaze is guaranteed dishwasher proof so is ideal as a mug used in a cafe, as a club room mug where a dishwasher is used or where a retail supplier wants to offer their customers that little bit extra. There is even a small stamp on the bottom of the mugs stating that it really is dishwasher proof. 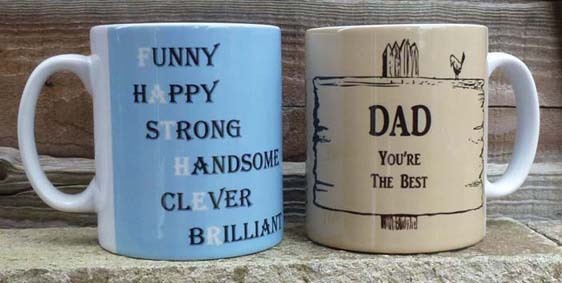 We wonder if there is there a point in putting up a photo, as on the surface it looks just like any of our other mugs but to prove the point ... here is a pair of Duraglaze mugs we did for Fathers Day.